The water park is set against a backdrop of barren hills and plenty of foliage. 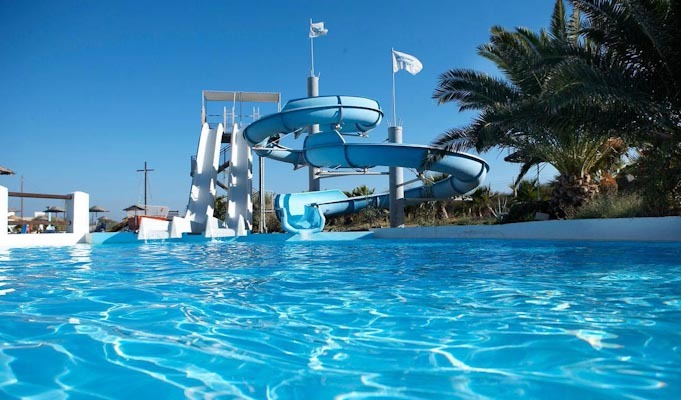 Swimming pools and extreme slides guarantee many hours of summer fun in the most well organized water park of the island Santorini. The pool bar and restaurant provide tasty refreshments for kids and parents alike, and the gift shop has some good holiday souvenirs. Water Park has 3 pools with sun beds and umbrellas that can accommodate up to 180 people. Also, there are 3 slides, two specially designed for children, who can play and to enjoy the water. For the children, there is a nice big playground, and for the little ones, a child-friendly pool and slide. The Water Park is open from 10:00 o’clock in the morning until 24:00 o’clock midnight. The facilities are open from 10 am to 7 pm.